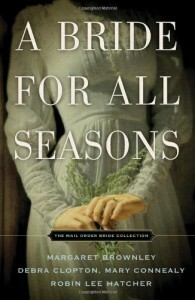 This is a compilation of four novellas from well-known Christian authors of western romances. Each follows a mail-order bride in 1870, as she meets the man she has been introduced to through the Hitching Post Mail-Order Bride Catalogue. Things don’t go quite as planned, as each couple find out that Melvin Hitchcock has altered their letters…And Then Came Spring by Margaret Brownley is the story of Mary-Jo Parker, who arrives in Kansas just as her betrothed is being buried, leaving behind an orphaned son in the care of her almost brother-in-law, the handsome and unmarried town Sheriff. An Ever After Summer by Debra Clopton sees murdering Melvina Eldora Smith moving to Texas, in search of love and family, but finds herself married to Mathew McConnell who is still in love with his dead wife. I think this was the weakest story, possibly because Clopton usually writes contemporary romance.Autumn’s Angel by Robin Lee Hatcher has Clay Birch seeking a bride with no children to help him open an Opera House in his small western town. He’s less than impressed when Luvena Abbott arrives with her orphaned nieces and nephew.In Winter Wedding Bells by Mary Connealy, David Laramie’s doctor has told him he will die within months, so he is marrying Megan McBride to give his boys a mother and a home after he passes. Love wasn’t meant to be part of the marriage…The stories were a pleasant, easy read, although each had a completely different setting and no characters in common except for reference to Mr Hitchcock. They are romance novellas, which means the ending is pretty predictable and there’s no space to introduce or resolve more than the central conflict: two seemingly-incompatible people joined in marriage through the machinations of a less-than-honest publisher of a mail-order bride catalogue. It appears that the authors are planning another compilation, Four Weddings and a Kiss. If so, I hope they won’t be using The Hitching Post. While this was an amusing collection, I found myself getting tired of the central plot device by the last story. I wouldn’t be interested in reading more, even from authors such as these who I usually enjoy. I’d much rather read their full-length novels where I can see more character development and revisit favourite characters in later stories. Thanks to Thomas Nelson and Booksneeze® for providing a free ebook for review.